SIXTH INTER AMERICAN MEETING OF MINISTERS OF EDUCATION Better Opportunities for the Youth of the Americas: Rethinking Secondary Education Progress and. 2 EARLY CHILDHOOD POLICY IN CHILE AT THE CORE OF THE GOVERNMENTS PUBLIC POLICY, WITH TRANSVERSAL SUPPORT FROM THE VARIOUS STATE SECTORS NEW LAW THAT INSTITUTIONALIZES THE COMPREHENSIVE CHILD PROTECTION SYSTEM, CHILE GROWS WITH YOU HAS COMPLETED ITS LAST LEGISLATIVE STEP TO BECOME A STATE LAW, THUS ASSURING ITS CONTINUITY AND SUSTAINABILITY. 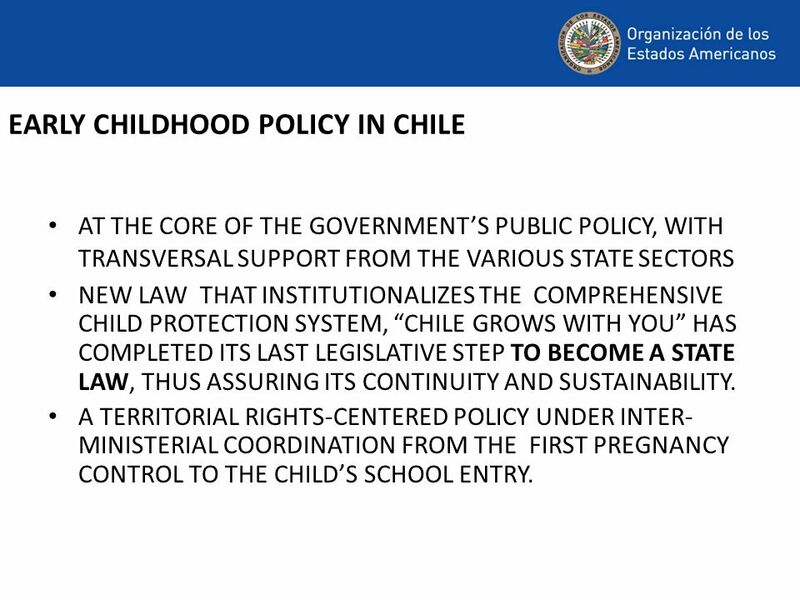 A TERRITORIAL RIGHTS-CENTERED POLICY UNDER INTER- MINISTERIAL COORDINATION FROM THE FIRST PREGNANCY CONTROL TO THE CHILDS SCHOOL ENTRY. 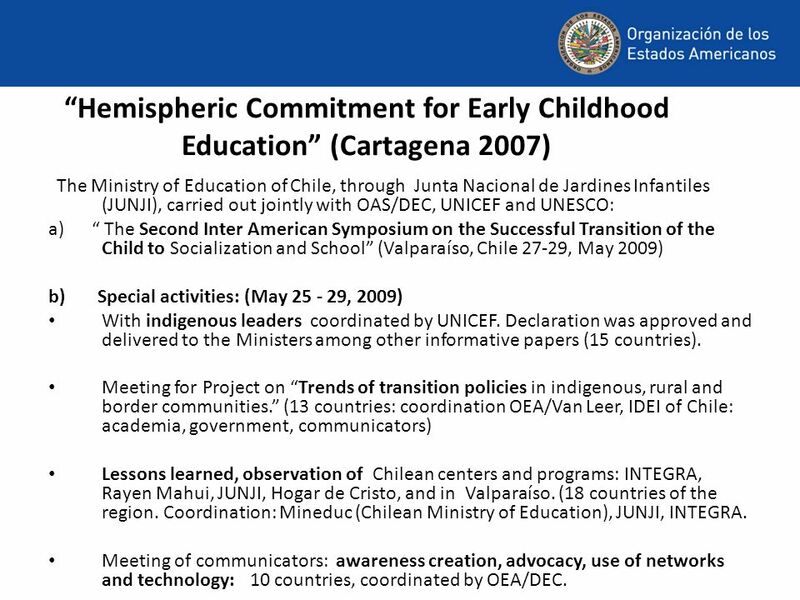 5 Hemispheric Commitment for Early Childhood Education (Cartagena 2007) The Ministry of Education of Chile, through Junta Nacional de Jardines Infantiles (JUNJI), carried out jointly with OAS/DEC, UNICEF and UNESCO: a) The Second Inter American Symposium on the Successful Transition of the Child to Socialization and School (Valparaíso, Chile 27-29, May 2009) b) Special activities: (May 25 - 29, 2009) With indigenous leaders coordinated by UNICEF. Declaration was approved and delivered to the Ministers among other informative papers (15 countries). Meeting for Project on Trends of transition policies in indigenous, rural and border communities. 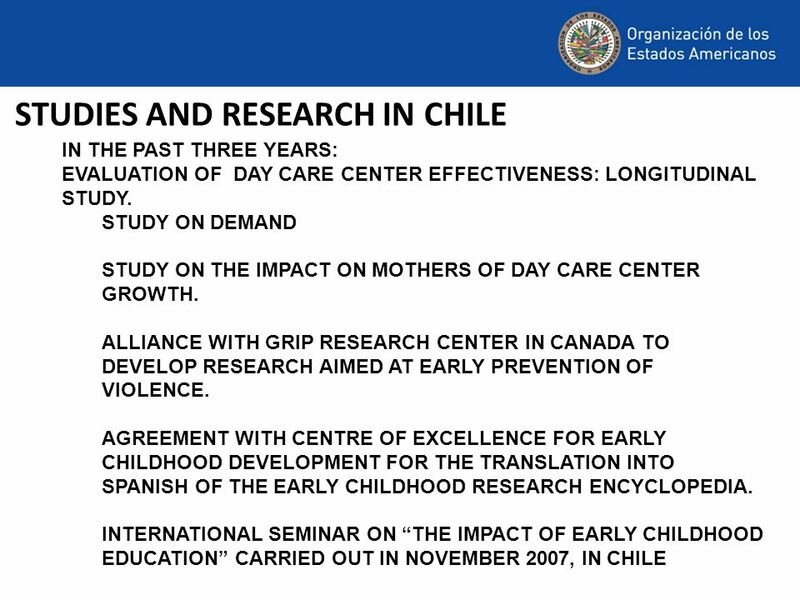 (13 countries: coordination OEA/Van Leer, IDEI of Chile: academia, government, communicators) Lessons learned, observation of Chilean centers and programs: INTEGRA, Rayen Mahui, JUNJI, Hogar de Cristo, and in Valparaíso. (18 countries of the region. Coordination: Mineduc (Chilean Ministry of Education), JUNJI, INTEGRA. Meeting of communicators: awareness creation, advocacy, use of networks and technology: 10 countries, coordinated by OEA/DEC. 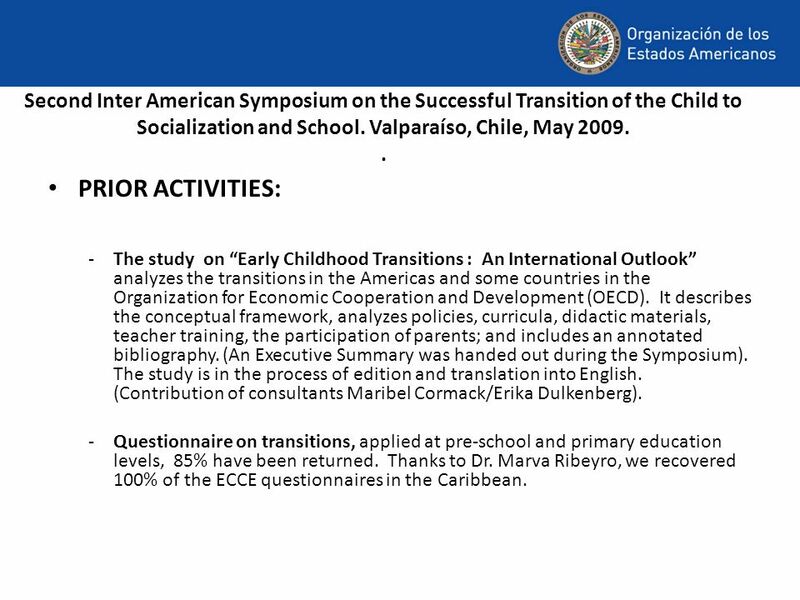 6 Second Inter American Symposium on the Successful Transition of the Child to Socialization and School. (Valparaíso, Chile, May 2009. -320 Participants: (128 FROM 34 COUNTRIES); Vice Ministers, National Directors of Early and Primary Education; of other sectors: health, social development, indigenous communities, planning, social security organizations, UNESCO, UNICEF, World Bank, OEI, CAF staff, indigenous councils; civil society researchers and experts and global enterprises. -LIVE BROADCAST (To 34 COUNTRIES in the region, Japan, Israel, and The Netherlands). All conferences and materials are posted on the Web/OAS and JUNJI. 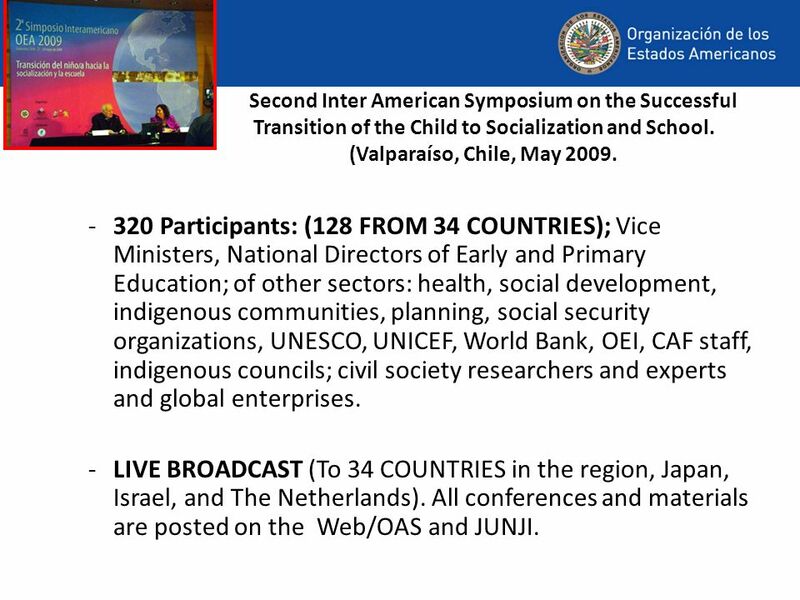 7 Second Inter American Symposium on the Successful Transition of the Child to Socialization and School. Valparaíso, Chile, May 2009.. 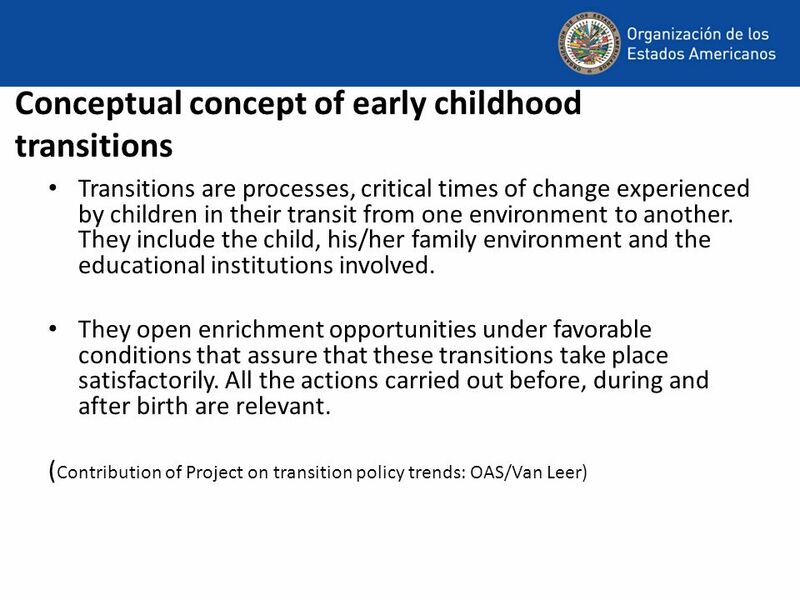 PRIOR ACTIVITIES: -The study on Early Childhood Transitions : An International Outlook analyzes the transitions in the Americas and some countries in the Organization for Economic Cooperation and Development (OECD). It describes the conceptual framework, analyzes policies, curricula, didactic materials, teacher training, the participation of parents; and includes an annotated bibliography. (An Executive Summary was handed out during the Symposium). The study is in the process of edition and translation into English. (Contribution of consultants Maribel Cormack/Erika Dulkenberg). -Questionnaire on transitions, applied at pre-school and primary education levels, 85% have been returned. Thanks to Dr. Marva Ribeyro, we recovered 100% of the ECCE questionnaires in the Caribbean. 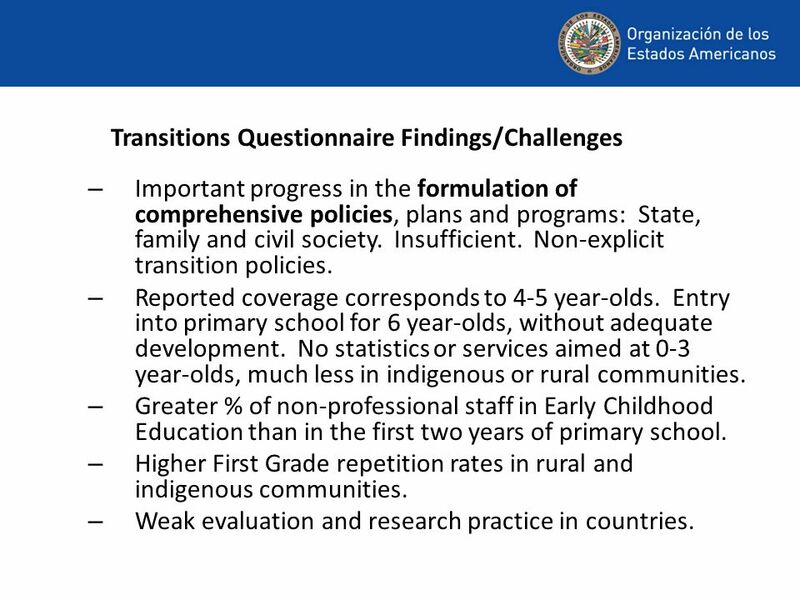 8 Transitions Questionnaire Findings/Challenges – Important progress in the formulation of comprehensive policies, plans and programs: State, family and civil society. Insufficient. Non-explicit transition policies. – Reported coverage corresponds to 4-5 year-olds. Entry into primary school for 6 year-olds, without adequate development. No statistics or services aimed at 0-3 year-olds, much less in indigenous or rural communities. – Greater % of non-professional staff in Early Childhood Education than in the first two years of primary school. – Higher First Grade repetition rates in rural and indigenous communities. – Weak evaluation and research practice in countries. 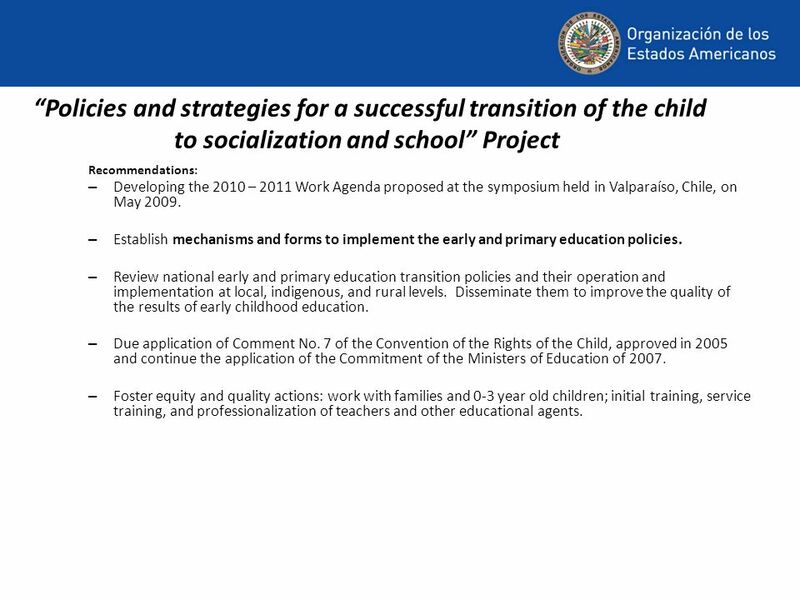 10 Policies and strategies for a successful transition of the child to socialization and school Project Recommendations: – Developing the 2010 – 2011 Work Agenda proposed at the symposium held in Valparaíso, Chile, on May 2009. – Establish mechanisms and forms to implement the early and primary education policies. – Review national early and primary education transition policies and their operation and implementation at local, indigenous, and rural levels. 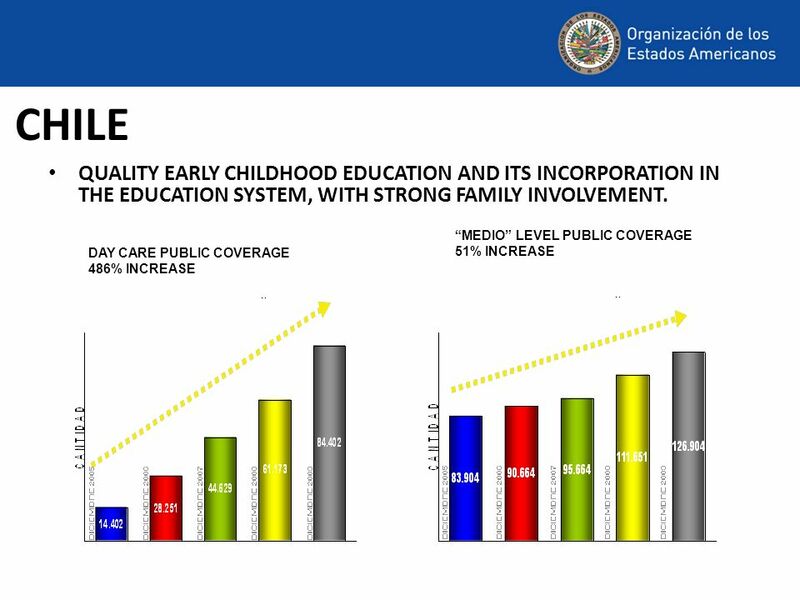 Disseminate them to improve the quality of the results of early childhood education. – Due application of Comment No. 7 of the Convention of the Rights of the Child, approved in 2005 and continue the application of the Commitment of the Ministers of Education of 2007. – Foster equity and quality actions: work with families and 0-3 year old children; initial training, service training, and professionalization of teachers and other educational agents. 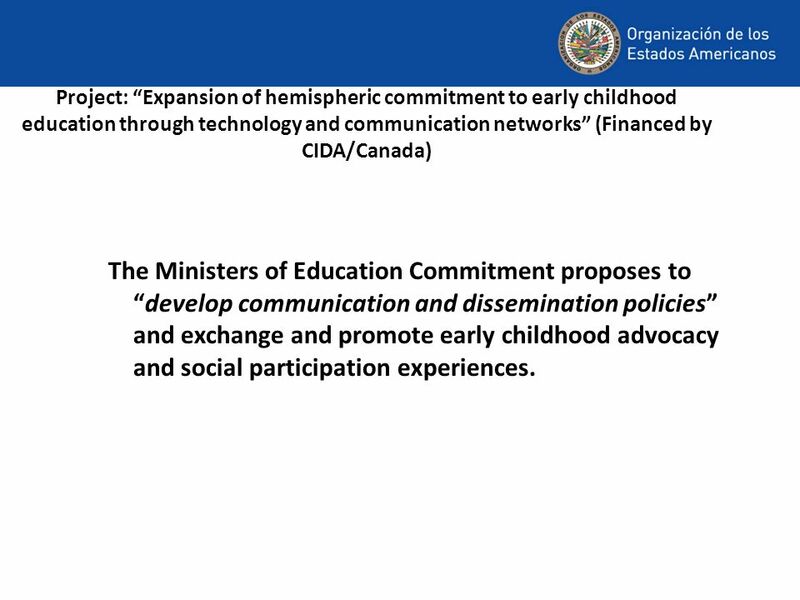 11 Project: Expansion of hemispheric commitment to early childhood education through technology and communication networks (Financed by CIDA/Canada) The Ministers of Education Commitment proposes todevelop communication and dissemination policies and exchange and promote early childhood advocacy and social participation experiences. 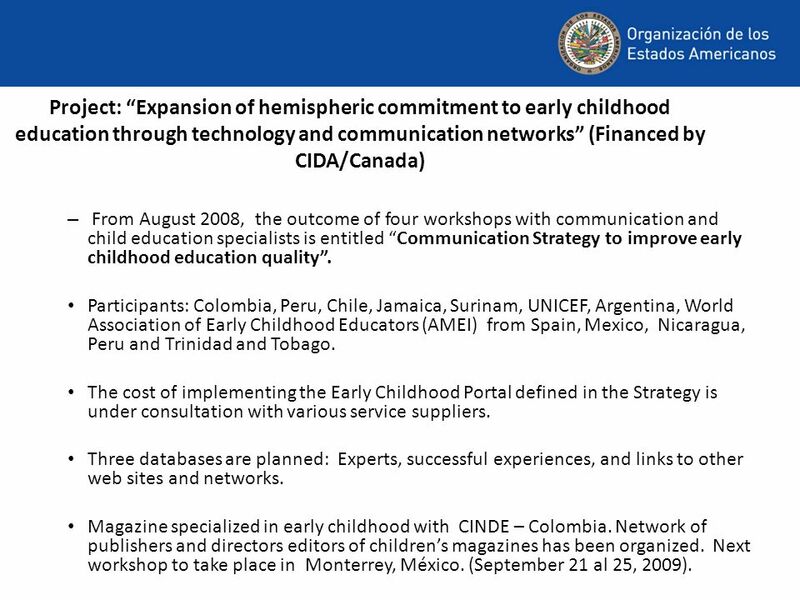 12 Project: Expansion of hemispheric commitment to early childhood education through technology and communication networks (Financed by CIDA/Canada) – From August 2008, the outcome of four workshops with communication and child education specialists is entitled Communication Strategy to improve early childhood education quality. Participants: Colombia, Peru, Chile, Jamaica, Surinam, UNICEF, Argentina, World Association of Early Childhood Educators (AMEI) from Spain, Mexico, Nicaragua, Peru and Trinidad and Tobago. The cost of implementing the Early Childhood Portal defined in the Strategy is under consultation with various service suppliers. Three databases are planned: Experts, successful experiences, and links to other web sites and networks. Magazine specialized in early childhood with CINDE – Colombia. Network of publishers and directors editors of childrens magazines has been organized. Next workshop to take place in Monterrey, México. (September 21 al 25, 2009). 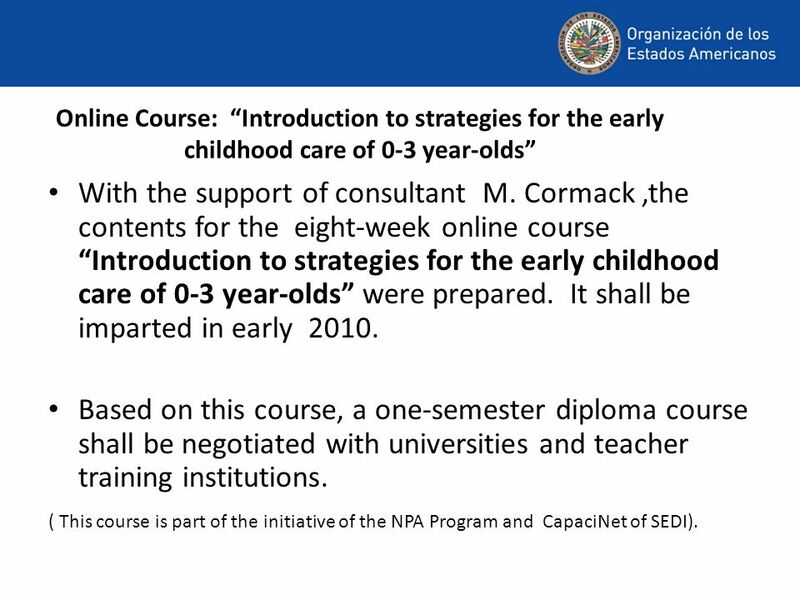 13 Online Course: Introduction to strategies for the early childhood care of 0-3 year-olds With the support of consultant M. Cormack,the contents for the eight-week online course Introduction to strategies for the early childhood care of 0-3 year-olds were prepared. It shall be imparted in early 2010. Based on this course, a one-semester diploma course shall be negotiated with universities and teacher training institutions. ( This course is part of the initiative of the NPA Program and CapaciNet of SEDI). 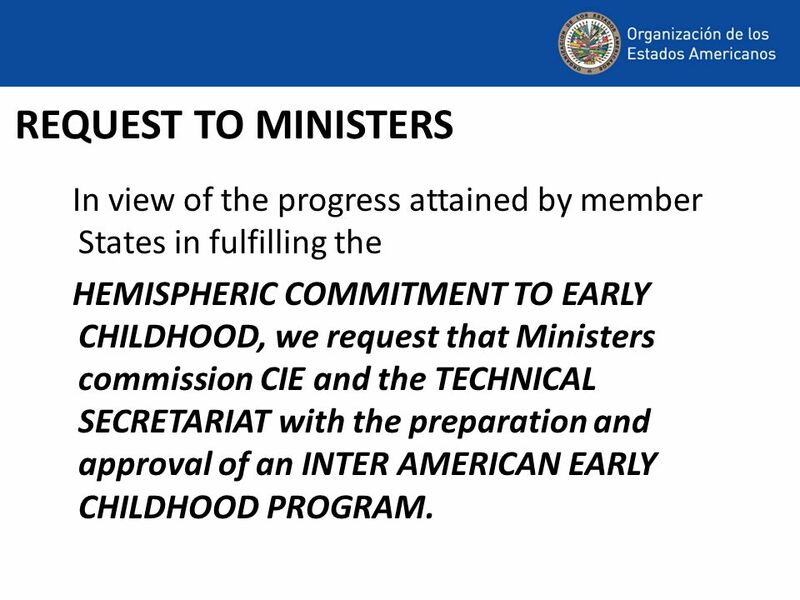 14 REQUEST TO MINISTERS In view of the progress attained by member States in fulfilling the HEMISPHERIC COMMITMENT TO EARLY CHILDHOOD, we request that Ministers commission CIE and the TECHNICAL SECRETARIAT with the preparation and approval of an INTER AMERICAN EARLY CHILDHOOD PROGRAM. 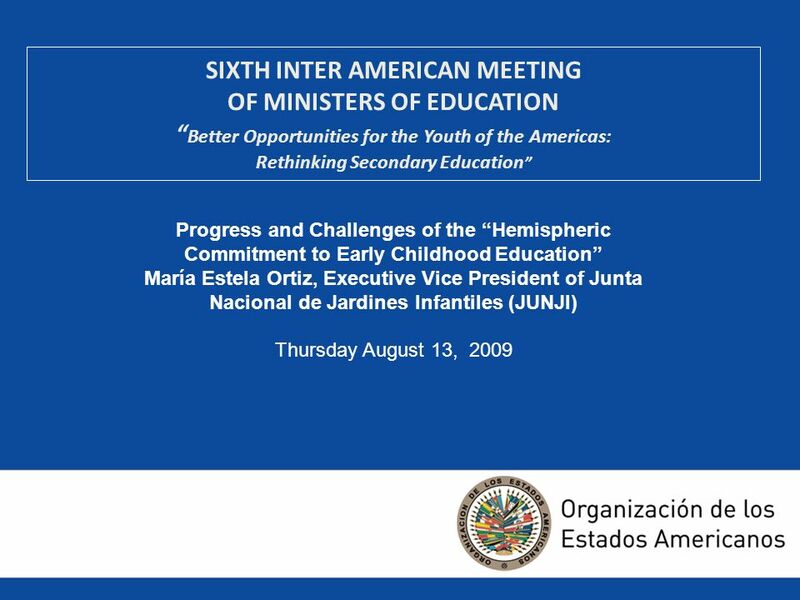 Download ppt "SIXTH INTER AMERICAN MEETING OF MINISTERS OF EDUCATION Better Opportunities for the Youth of the Americas: Rethinking Secondary Education Progress and." With the financial support of:. Introduction The Workshop Innovation and Information and Communication Technologies (ICTs) for the Productivity of Small. Migration and Development Program ( M i DE ) Special Committee on Migration Issues October 2009. SIXTH INTER-AMERICAN MEETING OF MINISTERS OF EDUCATION B etter opportunities for the youth of the Americas: Rethinking secondary education Hemispheric. The intersectoral approach within the OAS Inter-American Council for Integral Development (CIDI) First Meeting of Ministers and High Authorities of Social. Department of Education and CultureOrganization of American States State-of-the-Art of Early Childhood Development, Care, and Education Policies in the. XIII Meeting of the Authorities and Executive Committee of the CIE Patricia Quiroz, Specialist Office of Education and Culture September 6, 2012 Executive. Report of the President and Technical Secretariat of the Inter-American Committee on Culture (CIC) Lenore Yaffee García, Director Office of Education and. Inter-American Program on Education for Democratic Values and Practices Office of Education and Culture Department of Human Development, Education and. Progress Report CIDES Work Plan Department of Social Development and Employment OAS April 2010. From Cartagena to Quito: Progress on the Work Plan of the Inter-American Committee on Education Gloria Vidal, Vice Minister of Education, Ecuador. Regional Educational Indicators Project (PRIE) Activities Report 2008-2009.